Executives say that people are their most important asset, but most don’t walk the talk. They don’t have systematic strategies or even plans for how to get the people they want to want them. They don’t have measures and metrics for how they are doing in the war for talent. They don’t hold leaders accountable regarding human capital responsibilities. In many cases this is because top leaders don’t have concrete tools to help them do what they know they should. This book fills that gap. The book fills this gap in three major sections. The first section helps leaders understand why what they believe at a superficial level (that people are their most important asset) is profoundly true. The second section provides a systematic process and set of tools to help leaders get the people they want to want them. The third section helps leaders position people so that they can create sustainable competitive advantage. Most strategy books treat human capital as an enabler of competitive advantage rather than as the source of competitive advantage. 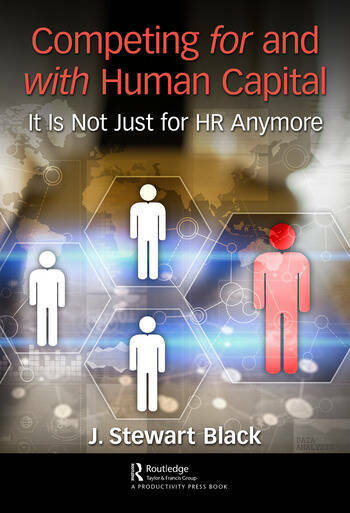 Most HR books treat human capital as a support activity to business strategy. This book places human capital where it should be in this day and for the future—at the center and as the source of competitive advantage. Introduction. Why Are Competing For and With Human Capital the Final Frontiers? The Shift in Sources of Competitive Advantage. The Accelerant Roles of Competition and Globalization. The Rise of Intangible Assets and Human Capital. The Decline of Employer and Rise of Employee Power. How to Effectively Compete For Human Capital. How Do Employees Assess Employees? How Can You Make Your EVP Concrete? How Can You Get the Employees You Want to Want You. How to Effectively Compete with Human Capital. Business Strategy: The Fundamental Building Block. Linking Human Capital Capabilities to Strategy. Aligning Key Processes to Support Your Human Capital Strategy. Dr. Black is Professor of Management Practice in Global Leadership and Strategy at INSEAD. He specializes in strategy, organizational transformations, leading change in turbulent times, and stakeholder engagement. Across his career Dr. Black has lived and worked in Europe, Asia, and North America. During that time, he has worked with over 200 organizations and 10,000 executives. Much of this work has been with senior teams as they determine strategic direction, identify needed culture shifts, define required leadership capabilities to implement their strategies, and align systems, technology, and processes to support the organizational transformation. In addition, he is frequently a keynote speaker at conferences and events on the topics of leading change, organizational culture, global leadership, innovation, and strategy. He is the author or co-author of over 100 articles and cases. His research has been published in the most respected academic journals, such as Academy of Management Review, Academy of Management Journal, Journal of International Business Studies, as well as in practitioner oriented journals such as Harvard Business Review, Sloan Management Review, and Human Resource Management Journal, and he has published articles in and had his work featured in a variety of newspapers and magazines such as Financial Times, The Wall Street Journal, and BusinessWeek. He is frequently sought out by and appeared in both print and live media. He is the author or co-author of 18 books, including best-selling textbooks, Management: Meeting New Challenges, Organizational Behavior, and International Business Environments: Text and Cases, as well as books written for practicing executives, such as Failure to Globally Launch, It Starts with One: Changing Individuals Changes Organizations, The Global Leadership Challenge, and International Assignments: An Integration of Research and Practice. Dr. Black received his undergraduate degree in psychology and English from Brigham Young University, where he graduated with honors. He earned his master’s degree from the business school at Brigham Young University, where he was on the dean’s list and graduated with distinction. After graduation, he worked for a Japanese consulting firm, where he eventually held the position of managing director. Dr. Black returned to the U.S. and received his Ph.D. in Business Administration from the University of California, Irvine. Dr. Black started his career on the faculty at the Amos Tuck School of Business Administration, Dartmouth College. Later he was a professor of business administration at the University of Michigan and Executive Director of the school’s Asia Pacific Human Resource Partnership. Prior to rejoining INSEAD, Dr. Black was Professor of Global Leadership and Strategy at IMD in Switzerland. At INSEAD Dr. Black served for four years as Associate Dean of Executive Development Programs for the Americas, as the founder and program director of Learning to Lead and Leading for Results, and as the program director for a variety of company-specific programs including, Astra Zeneca, Ciba, Ernst & Young, Lexmark, HSBC, IFF, Jones Lang LaSalle, Manpower, National Commercial Bank of Saudi Arabia, Nissan, NYSE, Rio Tinto, Siam Cement, Shell, Takeda Pharmaceutical, Toshiba, and Western Union among many others.